Eclectique x Art Bei Ton will take place on November 8th, in the Griessmuehle. The key words of this one night are a combination of knowledge, science, music performance and visual arts. Eclectique Event will always start at sunset with Live Experimental Performances, Workshops and will feature this time also an Exhibition. It curates an ethic and international line up of divers artists and most of the music performances are live on modular synth eurorack. 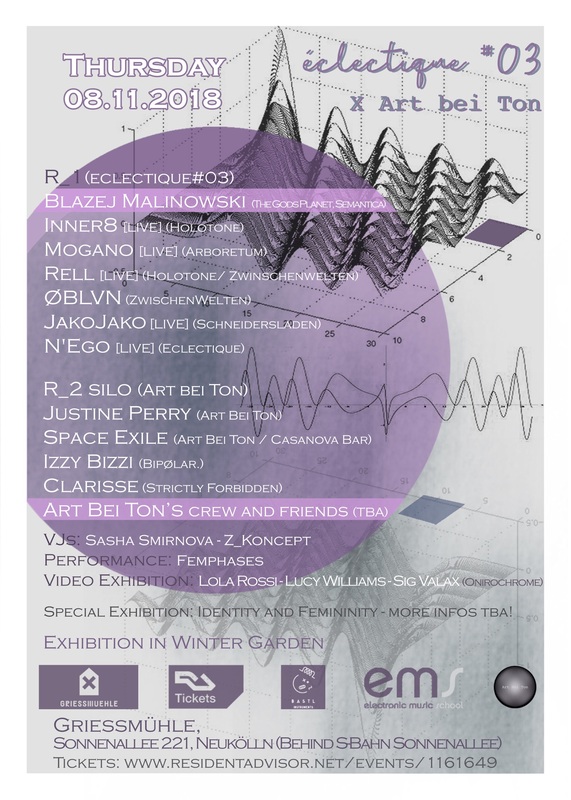 For this third edition of Eclectique, we decided to collaborate with Art Bei Ton, developing a concept mixing Techno, Ambient and Experimental music performances, together with visual arts, such as VJing, video installations and exhibition. They will investigate the Silo floor, as well as the Wintergarden with a special photo and video exhibition.